West Palm Beach, FL – The South Florida Water Management District (SFWMD) on Thursday approved a public-private partnership with the Lykes Brighton Valley LLC that will create the Brighton Valley Northern Everglades Public-Private Partnership Project. This project will treat water in the Lake Okeechobee watershed over the next decade. "Every gallon stored counts in situations like the current high water emergency South Florida is facing," said SFWMD Governing Board Chairman Federico Fernandez. "This Governing Board is thankful to Lykes Brighton Valley for stepping up and helping reduce nutrients in the Lake Okeechobee watershed." 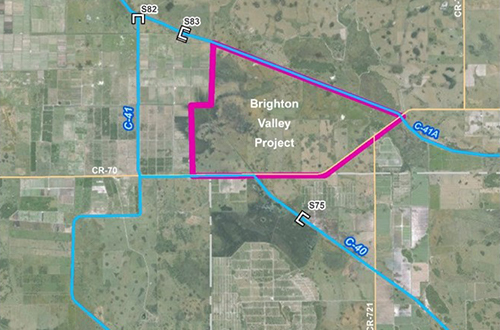 The Brighton Valley Project will create flow, averaging 40,000 acre-feet of water per year, through approximately 8,200 acres of privately owned land in Highlands County. That water will be taken from the C-41A Canal during excess water conditions and conveyed across the project's land in order to reduce nutrients in the water. The SFWMD Governing Board approved an 11-year lease and agreement for the Brighton Valley Project that includes $11.5 million for land improvements necessary to make the project feasible in the first year. Once the improvements are in place, the District will pay the Brighton Valley Project an annual fixed fee, which averages to a cost effectiveness of about $95 per acre-foot of water treated on the site for the next 10 years. The Brighton Valley project includes flow-through cells that will help remove nutrients such as phosphorus from the water before it is discharged to the C-40 Canal. The project is expected to remove 3.2 tons of phosphorus and 27.3 tons of nitrogen from the water. The funding for the project comes from a 2016 appropriation by the Florida Legislature specifically for public-private partnerships to benefit the Northern Everglades. Future Legislative funding will be necessary to continue this project.